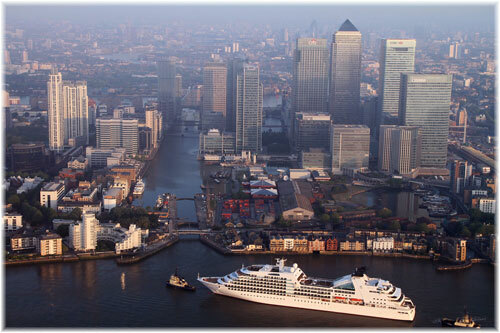 The 47,842-ton Viking Sea became the largest ocean vessel to be christened on the River Thames last Thursday. Hordes of people gathered on the river banks to see her sail through to the heart of London. 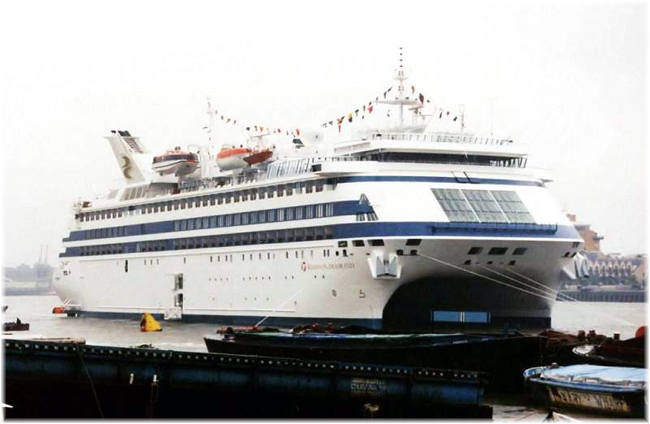 The first significant cruise ship to be commissioned in London was the 20,295-ton 354-berth Radisson Diamond in June 1982 and the last was the 32,346-ton 450-berth Seabourn Sojourn, christened by Twiggy in June 2010. The Viking Sun also exceeded by sixty-three feet Brunel’s great ocean liner, the 692-foot 18,914-ton Great Eastern, which was the first large ship to be christened on the Thames, in November 1857. 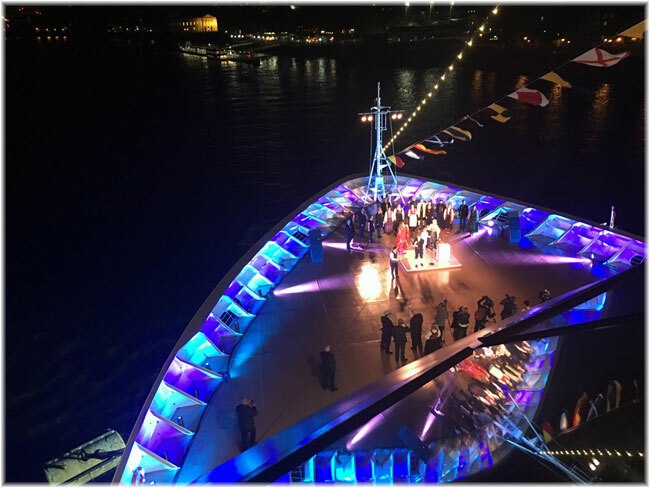 The 930-berth cruise ship was christened with a fireworks display on Thursday evening, having completed her inaugural voyage from Istanbul to Venice last month. As she moored in Greenwich at around 12.15 pm, forty-eight sailors saluted her with a traditional naval welcome, standing on the yardarms of the preserved clipper ship Cutty Sark. The new ship was christened by godmother Karine Hagen, daughter of Viking chairman Torstein Hagen and the company’s senior vice president. Using a copy of the Viking axe found buried under the Thames, Karine cut the cord to release the christening bottle of aquavit as fireworks lit up the sky over the River Thames. The Viking Sea is identical to the line’s first ocean cruise ship Viking Star, with blonde wood interiors and beautifully crafted furniture throughout. She is classified as a “small” cruise ship these days, for 930 passengers, and every cabin has a balcony, king-size bed and large walk-in shower. It has been said that the Viking design evolved from that of the original eight R ships built for Renaissance Cruises in 1998/2001. A comparison might therefore be useful of these ships to the R ships, as well as to the new Oceania ships that also evolved from the R ships. While the Marina and Riviera are double the size of the R ships, the new Viking ships lie between the two Oceania designs. Something the Oceania ships lack is a wraparound promenade, as they are fitted with shorter promenades on each side not unlike the class-conscious tourist class liners of yore. But the Viking ships have a 360-degree promenade, where four laps equals a mile. Where the Oceania ships have a single-deck Horizons lounge up forward above the bridge, the Viking Ocean ships have a two-deck high Explorers Lounge. And where the Oceania ships share midships swimming pools, the Viking Ocean ship also has an Infinity pool overlooking the stern. The Viking ships have a three-deck Atrium compared to just two on the Oceania ships while the main dining room in all three classes is located aft on the same deck as the promenade. The alternative restaurants on the Oceania ships are located in the upper deck area aft while those on the Viking ships are located a deck below the main dining room. The Viking Spa has also been banished from a high-value forward-facing area to a location within the hull below the theatre. While the new Oceania ships have twenty-three suites and the R ships ten, the Viking ships feature just eleven large suites, including an Owners Suite. By comparison, however, all Viking accommodations are outside with balconies, while the Oceania ships have many cabins without balconies and inside cabins on even its newest ships. 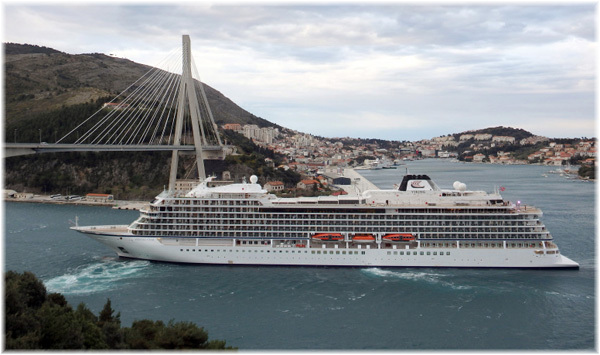 The new Viking ships will be primarily destination-oriented and the will be spending much of their time in the Mediterranean and the Baltic until this autumn, when the Viking Star will make Viking’s first Transatlantic cruise leaving Bergen for Montreal on September 18. The crossing has been sold out for some time, as has that of Azamara Quest, which leaves Southampton for Montreal on September 9. Both are lesiurely 15-night cruise crossings. Last week the US media began by saying that the 30,277-ton Carnival-owned Adonia was the first US-based cruise ship to call on Cuba in over fifty years. But thanks go to Allan Jordan and Michael Grace for bringing it to the media’s attention that this was quite wrong. 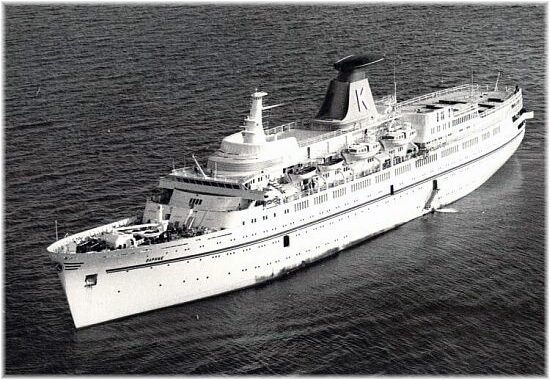 Thirty-nine years ago, in May 1977, another US-based ship, Carras Cruises’ 15,833-ton 400-berth Daphne, made an inaugural cruise to Havana from New Orleans. In 1977, Carras Cruises, beloging to a Greek shipowner who was new to the cruise business, got permission to take the Daphne into Havana. In a special jazz cruise organised by the late cruise impresario Fred Mayer, musician Dizzy Gillespie was on board and there was much media reporting then that the Daphne was the first ship to carry US passengers to Cuba since the Revolution. But even in 1977 the media had it wrong. Cruise ships had continued to sail from Miami to Havana after the Revolution but only for the months to the end of the winter cruise season of 1959. They had not returned, however, in the winter of 1959-60, and the usual Miami-Havana ship, the 4,945-ton 400-berth Florida, had switched for good to the Miami-Nassau run. The Daphne sailed from New Orleans to Havana and then to New York, where a luncheon was held on board with lots of invited media. She then sailed back to Havana but her next Cuba cruise had to be canceled due to bomb threats and protests by Cuban patriots, and the ship departed for her summer season in the Mediterranean. On the Daphne’s first Havana cruise, she also had four Cuban-Americans on board. Initially the Cubans refused them entry but the authorities relented on the second day in port, so the Daphne’s two Cuban-born couples living in Chicago were permitted to go ashore. For a while in the late 1970s, 7-night Cozumel, Grand Cayman and Havana cruises were offered by ships such as Carras’s 16,531-ton Danae, sister ship to the Daphne, and Black Sea Shipping Company’s 15,409-ton 500-berth Kazakhstan and 13,758-ton 460-berth Odessa, which were handled by Montreal-based March Shipping. The Daphne made a few more stops in Havana before Cuban-American relations deteriorated, and the door closed once more after President Jimmy Carter left office. At the same time, the Kazakhstan and Odessa disappeared from the scene after Russia’s invasion of Afghanistan in December 1979. The Daphne and the Danae meanwhile moved to operation by Costa Cruises. 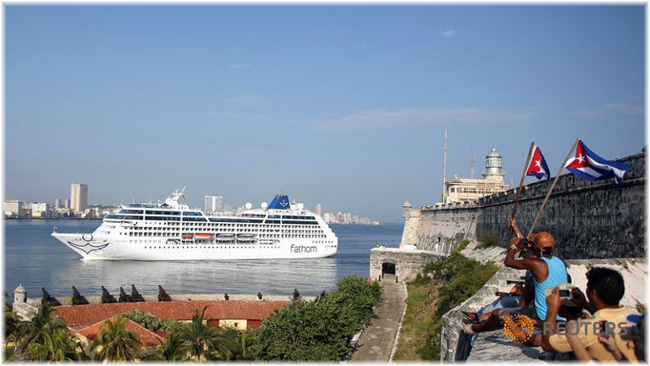 Fathom’s Adonia will cruise twice a month from Miami to Havana, Cienfuegos and Santiago de Cuba, alternating with cruises to Carnival Corp & plc’s new cruise terminal at Puerto Plata in the Dominican Republic. Back to Viking, it was announced last week that in 2018, London will become the final stop on the Viking Sun’s first world cruise. 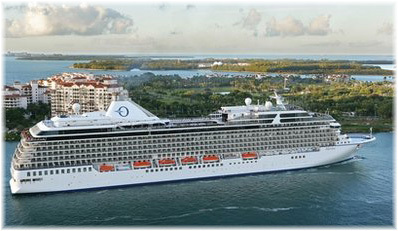 Viking Ocean announced plans for an epic 141-day world voyage, a first for them. Departing Miami on December 15, 2017, the cruise will include sixty-six destinations, and will cost nearly £31,000 per person in a balcony cabin. The epic journey will sail westabout from Miami to London, including stops in Cuba, Tahiti and Malta along the way. Viking’s fourth ocean ship, the Viking Sun will visit five continents and overnight stays have been scheduled for twelve of her ports. Every guest will receive a complimentary shore excursion at each of the sixty-six ports, free Wi-Fi throughout the cruise and business class flights. 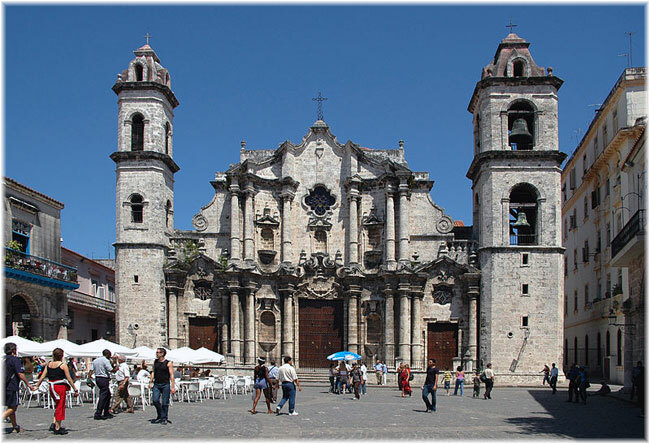 Early in the journey, guests will spend two days in Havana, where they will be entertained by a local jazz ensemble and explore the city’s colonial architecture. Viking Sun will then sail through the Panama Canal before proceeding to Los Angeles, Tahiti, New Zealand, Australia and Shanghai. The itinerary also includes Bangkok, Singapore, India and the Mediterranean before she makes her final call in Greenwich in 2018. The itinerary is still subject to change, but passengers are also scheduled to stop in destinations that have suffered downturns following terror attacks. These include Sharm el-Sheikh, Tunis and Algiers. With the trip still more than eighteen months away, it is expected that the security situation could change. 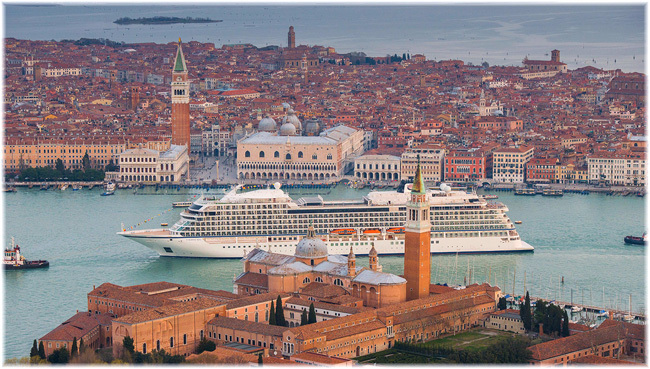 The Viking Sun is set to follow sister ships Viking Star (2015), Viking Sea (2016) and Viking Sky (2017) in order of entry into service from the Fincantieri shipyards in Italy.